I originally wrote this for the Achilles International-Colorado blog in October, but I wanted to share it on here as well. That statement pretty much summed it up for me; I hated running. I tried to run when I was in middle and high school, but running on a stiff prosthetic foot that’s designed for walking is no easy feat. 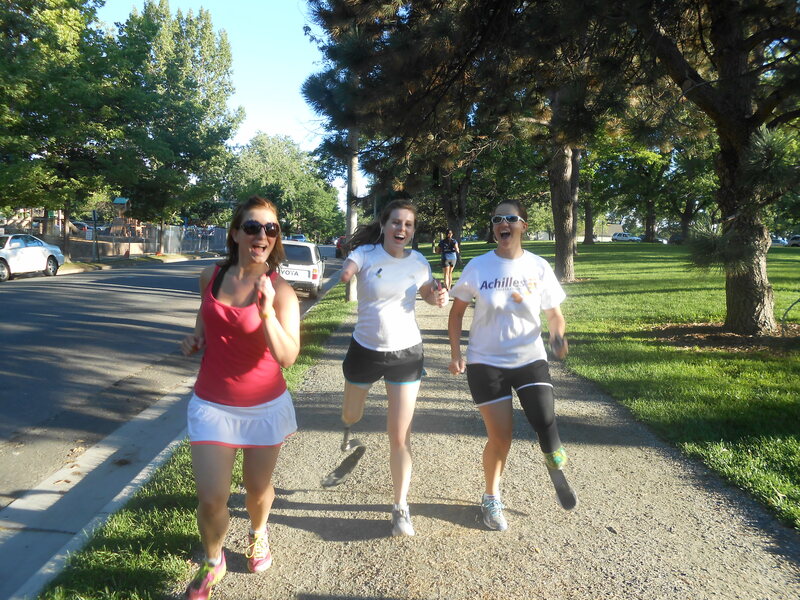 Not realizing what a big difference a running prosthesis could make, I designated myself as a non-runner and accepted the fact that I’d never be a runner like my mom who ran cross-country for Colorado State or my aunt who completed two Ironman Championships in Kona. Then, in late 2010, everything changed when I got a running leg. I started running with my then boyfriend (now husband) and I couldn’t believe what a difference the new leg made. I wasn’t doomed to be a non-runner for life, I just hadn’t had the proper equipment! My excitement was short-lived, however, because I started having piercing pain in my residual limb about two months later. After seeing numerous unhelpful doctors who had never seen an amputated leg like mine before, I finally hunted down the surgeon who did my original amputation in 1986. I was in luck because he was at a hospital in Pennsylvania and was willing to look at my leg, x-rays, and multiple other medical documents in order to provide a second opinion about what a doctor in D.C., where I was living at the time, had suggested as my best option. It was determined that I had a neuroma (basically when your nerves bundle up into a painful ball and send shock waves of pain up your leg when pressure is applied to it—a situation that is inevitable when you wear a prosthetic leg) and I needed some bone shaved off the bottom of my tibia because it was quite sharp and causing my skin to be in a constant state of anger. So, there I was, in my first year of law school and about to spend my Spring Break on Percocet and unable to wear my prosthesis for at least 2 months. The next two years or so were filled with ups and downs as we struggled to find a comfortable solution for fitting my “new” residual limb. I struggled with new kinds of pain and it seemed like the surgery had only moved the sensitive places on my residual limb rather than eliminating the pain. I was frustrated that I had gone through the surgery and months of recovery without seeing any positive gain. I exercised less and complained more. It had a deep impact on me and I started to feel like I didn’t really know who I was anymore. Fast forward to March of 2013. I had moved to Colorado and my friend Jessica convinced me to walk a 7K with her. I hadn’t attempted running since 2010 because I was afraid that the increased impact on my residual limb while running was what had caused the neuroma in the first place, but I knew I could walk that distance. The excitement of race day got to me and I decided right then and there that I wanted to give running another shot. When I first started running, I ended up walking most of the time, but Jessica stuck with me and encouraged me to push myself a little more each time. I found Achilles and we started “running” with them consistently on Mondays. There are many weeks I would have skipped running altogether had it not been for Achilles. Knowing that I have a group of people who expect me to be there and support me no matter what really helps keep me motivated. When I first started “running” with Achilles, I probably walked over half of the 2.5 mile loop around Wash Park, only running in short spurts because that was all I could handle. On a Monday Run in October, Jessica and I were exhausted from the Hot Chocolate 5K the previous Sunday so we decided not to push ourselves too much at the Achilles run. I could hardly believe it when we ran the entire 2.5 mile loop without a single walk break and we held a pace of 10:27 minutes/mile. After 6 months of consistency, I felt like I’d overcome some invisible barrier that was holding me back from being a real runner. What’s even better than finally feeling like I can call myself a runner! My neuroma has not returned and my residual limb has started building muscle, which has actually made my prosthesis fit better. Rather than causing pain, running has actually decreased the pain I tolerate on a daily basis because of my prosthesis. The bottom line is that I hated running for 6 months, but kept with it anyways because of the support and encouragement of my friends at Achilles. Without them, I never would have overcome that invisible barrier and I wouldn’t be able to call myself a runner today. I run for the typical reasons people run (fitness and so I can eat more pizza), but I also run because there have been times when I couldn’t. Emily, You are a hardknock rocker! I am so happy we met by the food trucks that Tuesday;) The rest is history because the future is so bright.